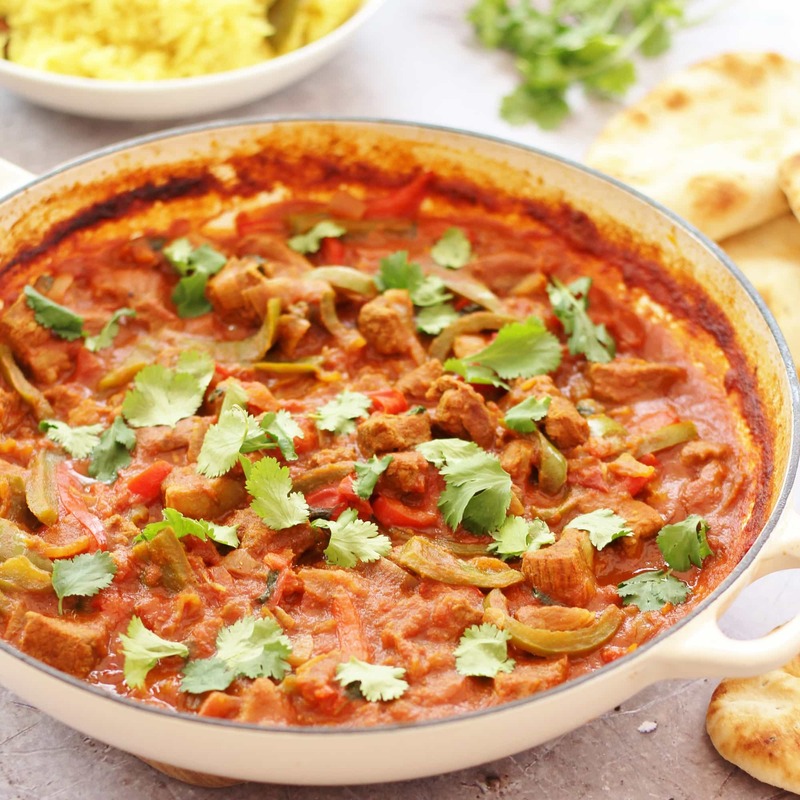 A really easy version of a curry house favourite, this Easy Lamb Jalfrezi is bursting with flavour and only requires a few minutes of hands on time – the perfect fakeaway! I am a huge fan of curry and you will find loads of easy peasy curries on Easy Peasy Foodie, but one curry I have been itching to work on and create a simplified, but no less tasty version of, is one of the UK’s best loved curries – a staple feature in India restaurants up and down this country – the Jalfrezi. I have been working for a few months now as a Lambassador with the ‘LAMB. 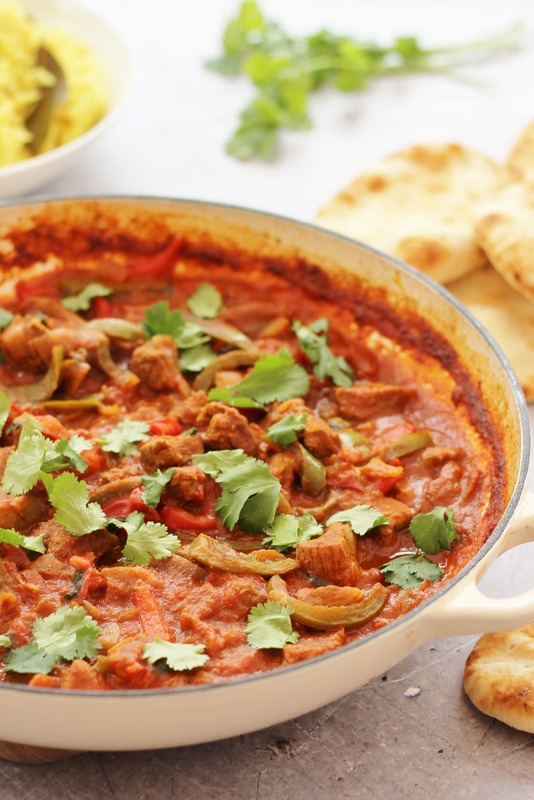 Tasty Easy Fun’ campaign, creating and reviewing recipes and helping spread the word about how great lamb is, so I decided I absolutely had to make one of my March Lambassador recipes a Lamb Jalfrezi. Making a curry at home can seem a bit daunting, but it’s actually incredibly easy. I think what puts most people off is the long list of spices, but really, once you’ve bought them that’s the hard part over…tipping a few spices into a pan is easy peasy! Having said that, when creating my easy peasy recipes I do try hard to make sure the ingredient list is not too long and I recognise that most people do not have a cupboard full of spices! So, I try to simplify my recipes so they include only the essential ingredients and a minimum of processes and pots and pans. My aim is always to get maximum flavour, with the minimum of fuss! 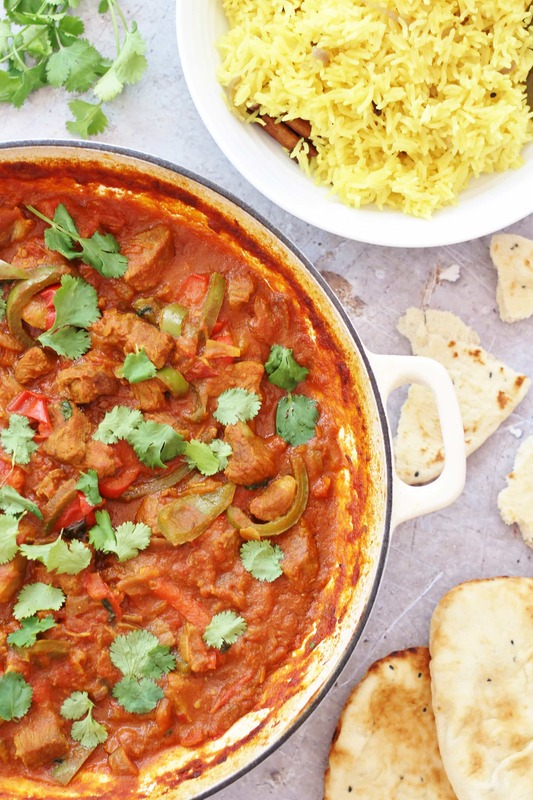 When I was researching this curry, I was intrigued to find there is no one set spice blend or recipe for a Jalfrezi, but this is good as it allowed me to focus on the essentials. I focused on what the recipes I read had in common: the spices that occurred most frequently in the Jalfrezi recipes I read were cumin, coriander, ginger, turmeric and garam masala – so these are the spices that feature in my Easy Lamb Jalfrezi. There wasn’t even a consensus as to the recipe, but factors that remained constant in the recipes I researched were a tomato base with lots of onions, peppers, chilli and garlic. Most of the recipes were quite complex with several stages, and lots of pots and pans. I have simplified the process drastically to create a one pot recipe which only needs a few minutes hands on time and then gets popped in the oven for the rest of the time. This ensures the sauce has a real depth of flavour and the lamb is meltingly tender. In my recipe I put the peppers in half way through cooking so they retain a bit of texture, but if you need to go out whilst the Lamb Jalfrezi is cooking and it is more convenient for you to pop the peppers in at the beginning, do so – the curry will still taste good, it’s just that the peppers will be a little softer. I have chosen to serve this curry with my Easy Peasy Pilau Rice, it’s a great side dish, and goes so well with the Lamb Jalfrezi. If you just want to keep things simple, serve with plain boiled rice or some naan breads. Alternatively, if you are cutting down on carbs at the moment, this curry would also go very well with my Indian Spiced Cauliflower Rice. It almost goes without saying that, like most curries, this Lamb Jalfrezi tastes just as good, if not better, the next day. So why not make extra and have yourself an even easier meal the next day? Or freeze for a homemade ready meal later on in the week? Drizzle about 2 tablespoons of oil into a large ovenproof saucepan or cast iron casserole dish. Add the onion and cook on a gentle heat, with the lid on, for about 3 minutes, until the onions are softened but not brown. Add the garlic, ginger, chilli, cumin, coriander, turmeric & garam masala. Stir well and cook for 2 more minutes with the lid off. Add a splash of water if it gets too dry. Next add in the lamb. Stir well to coat the meat in the onions and spices and then add the tomatoes, plus salt and pepper to taste. Bring the curry to the boil and then put the lid on and put in your preheated oven for 45 minutes. After 45 minutes add the sliced green and red peppers, stir well and continue cooking in the oven for another 45 minutes (1 hour 30 in total). 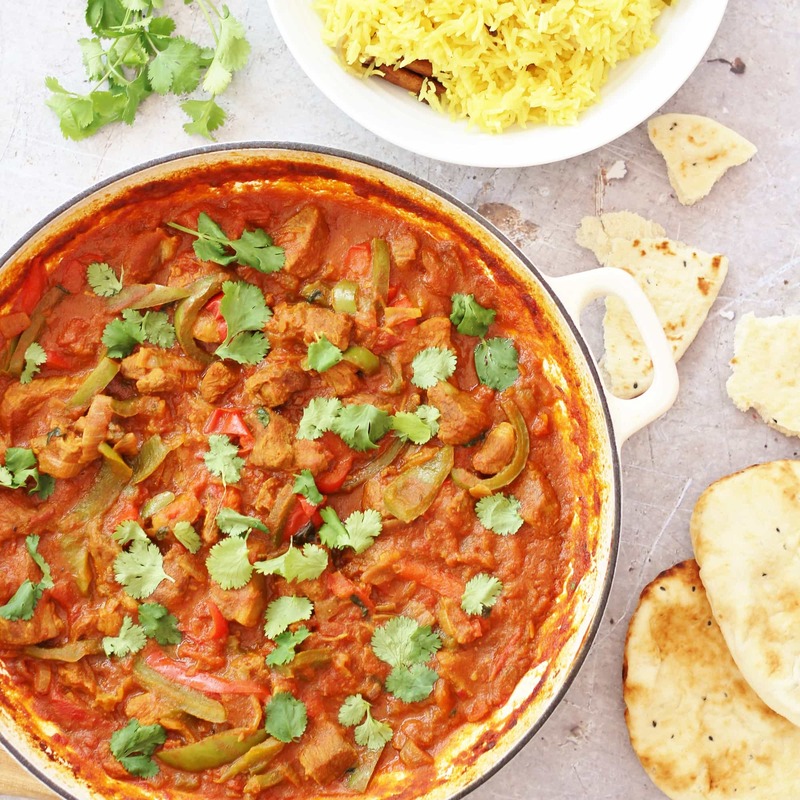 I have only used one teaspoon of chilli flakes in my recipe – which results in a medium strength curry – as I like to make my food family friendly and this is about as hot as my kids can handle! However normally jalfrezi is a little hotter than this, so do put in more chilli if you like your jalfrezi hot!! Oh wow! That looks like it’s totally packed full of flavour! It looks like it would really work well with any number of different meats which is great too, as we’re an indecisive household and I’m often diving into the bottom of the freezer when I forget to do the shopping, so I love recipes that are easily adaptable! 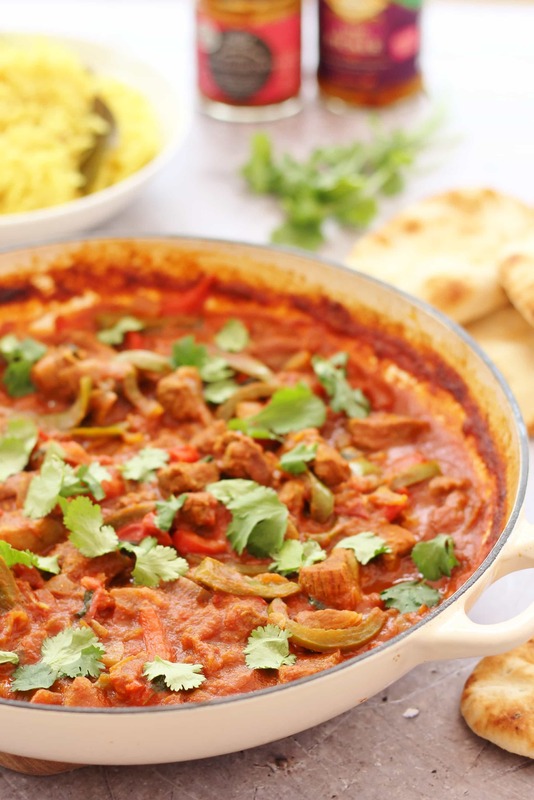 Mmmm this looks so good Eb, I do love a one pot dish and an easy peasy way to make a jalfrezi sounds ideal to me! Will give it a whirl soon, I bet it would work well in a slow cooker too since you cooked yours slowly in the oven. Great Curry Eb. Looks super-tasty!